Buy the Farm . . . Share: Easter? I Hardly Know Her! As is tradition my parents were headed down this Easter to pay us a visit. At least as is tradition for the past couple of years anyway. 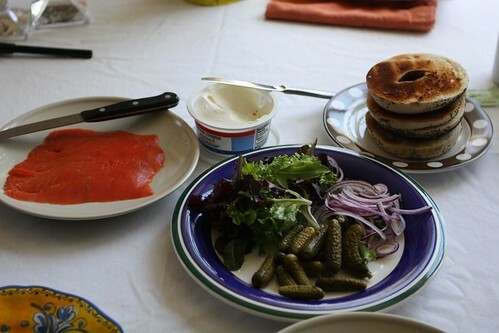 When they got here I put out a simple brunch of smoked salmon, toasted poppy seed bagels, rye bread, cornichons, cream cheese, greens, and sliced red onion. 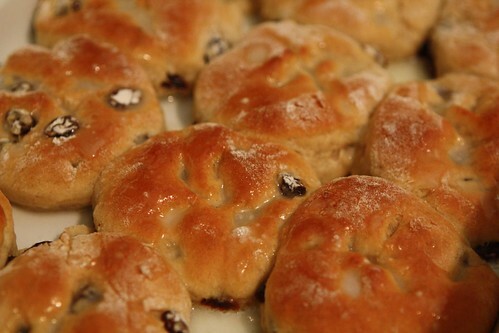 Jen took the first shift in the kitchen and put together some hot cross buns. This came with the normal amount of lament and regret that generally accompanies her baking sessions. The result was also the same as her normal baking sessions: delicious results. And no one even noticed that there were only raisins and not raising and currants! I am still suspect of any recipe that requires both raisins and currants. That seems a bit redundant. I showed my parents the best of what New York State has to offer in terms of cheese. 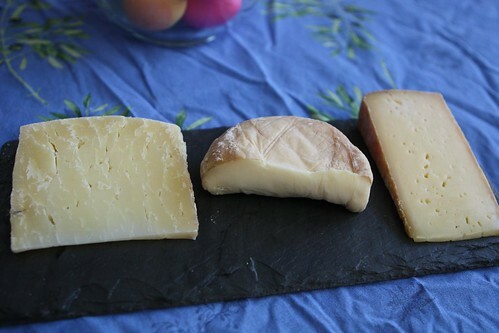 I made up this slate of Toma Celena from Cooperstown Cheese Company in Cooperstown, NY; this Eden from Sprout Creek Farm in Poughkeepsie, NY; and this washed rind Point of Origin, also from Sprout Creek Farm. The lamb I bought had an excessive amount of fat on it. After trimming it all off I decided, rather than throwing it away, to just mix it in with the vegetables I was going to roast. 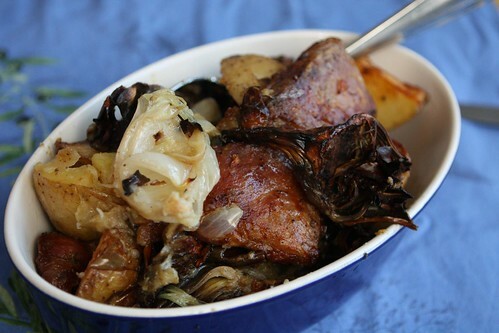 I threw some potatoes, spring onion, crushed garlic clove, and quartered artichokes into the pan along with some olive oil and threw it in the oven while we snacked on the cheese. Today was the exact day my twin batch of beers was ready for consumption so I served up the first batch, this Tea & Toast from Brooklyn Brew Shop. 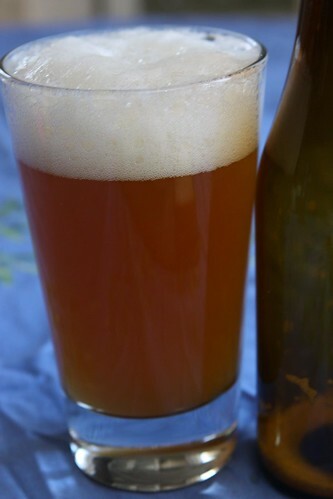 It came out very nicely despite the fact that I had to use my mouth to start the siphon when I bottled it, something I had been worried about at the time. Apparently washing my mouth out with vodka ahead of time actually worked! 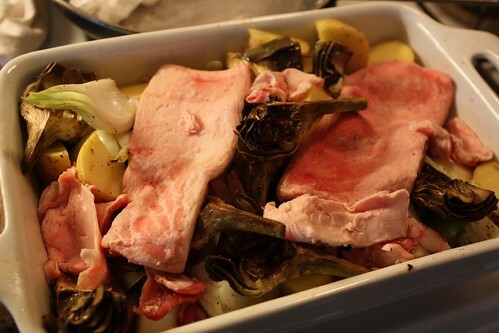 After enjoying the cheese and searing the lamb rack and asparagus on the grill outside I took out the vegetables which had cooked up beautifully with the extra lamb fat and meat added. 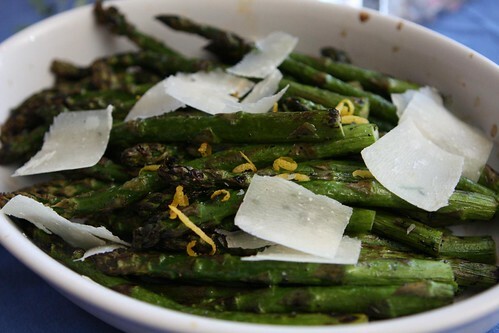 I topped the grilled asparagus with some shaved Bella Lodi, lemon juice, and lemon zest. 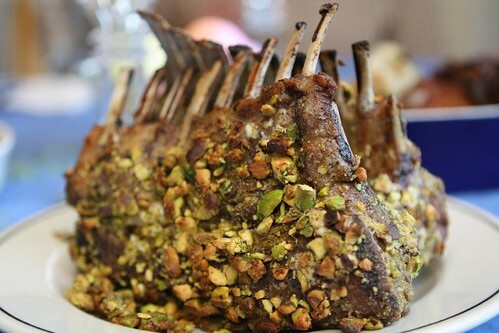 I smeared the outside of the seared lamb rack with goat cheese and then crusted it with crushed pistachios. This is a dish I made at a restaurant I worked at years ago and Haven't made in about a decade. I think I made it for Jen in 2002 when we first met. Structurally it didn't hold together all that well due to me being a little too hasty about my pistachio crushing but the flavor was there. 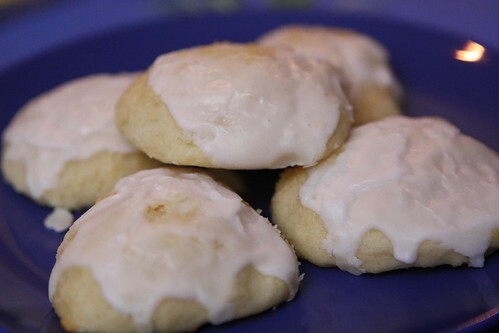 My mother brought some Italian egg biscuits that she'd made which were delicious. Even Jen, a longtime hater of all things anise, was quite taken with them. The best part is that my mom made a giant bag of them which are just in time to replenish the depleted banana muffin supply in our freezer. This truly was an amazing Easter weekend. It started off with the greatest chicken we've ever consumed and ended with a freezer full of cookies. I guess we have a lot to be thankful for. Easter next year will be so different! I should start trying to figure out how to knit some easter bunnys now! Oh and the food looked good to (except the lamb). Next year will be quite different indeed. I will puree their Cadbury Cream Eggs for them. Unless they're doing solid food at that time. I don't know anything about babies . . .
Dinner was wonderful, beginning to end! And next year will be so exciting that we won't even care if we have peanut butter sandwiches for dinner! Your dad is a good man.